When Pippa and Aaron Witcher got married in 2006, they both quit their jobs. They decided to ask friends for money as wedding presents, instead of household items. Pippa, who used to work in public relations, and Aaron, now 34, who worked in market research, decided to leave everything behind and travel around the world for six and a half months, as a kind of career break for an extended honeymoon. They also hoped the trip would help them with future business plans. “Our plan was to come up with something to do when we came back to revolutionise our lives and move away from office work,” says Pippa, who lives in High Wycombe, Bucks. “I knew I always wanted to do something for myself, although I enjoyed the work there and liked the people. 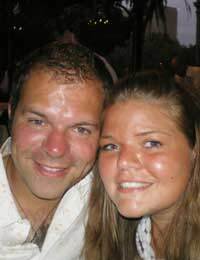 The couple got married in August, 2006, and after their wedding they left the UK in November. For the first three months of their career break they went to Africa, starting in Nairobi, then taking an overland trip going through Kenya, Tanzania, Malawi, Botswana, Namibia and South Africa. Then they travelled to Australia, visiting several towns before going to New Zealand for a month, and then to Fiji. Finally, they went to the United States as part of their career break, including California, Illinois and Florida, and then Mexico. The couple travelled a lot, sampling different food and seeking items they hadn't seen before. “We went to farmer's markets in Australia and New Zealand, comparing farmers' produce to what they have here. There were lots of things we wanted to bring back or import,” says Pippa. “We also loved being in America and seeing all the food there, apart from the mainstream American food scene. There were lots of specialist producers, and we found lots of things we had never seen before. “In Australia we found Iranian fairy floss, which is like candy floss but really light, like spools of cotton. There were amazing cheeses in New Zealand, lots of goats cheeses, and again, in America, the candy and treat confectionery market was so many light years ahead of what you could get in the UK that it was truly amazing. Upon their return to the UK, the couple decided to capitalise on their food interests - and their newfound delicacies. While Aaron has since taken up a new job in market research, Pippa now runs their company full-time, an online confectionery business called The Big Yum. He hopes to soon work with her there full-time as well. “When we came back in 2007 we started putting our business plans into place and started The Big Yum. We got a lot of inspiration from America, and sell chocolate pretzels, chocolate drizzled popcorn, pic 'n' mix selections and things like that.